Carrying a reliable battlefield sidearm increases the chances of a successful airsoft mission. This CO2 pistol by SIG Sauer makes a perfect companion to any high-powered AEG. The SIG Sauer SP2022 has a lightweight plastic body that is comfortable to hold & fire and a BAXS hop-up unit that lets you dial in excellent long range accuracy for faraway targets. 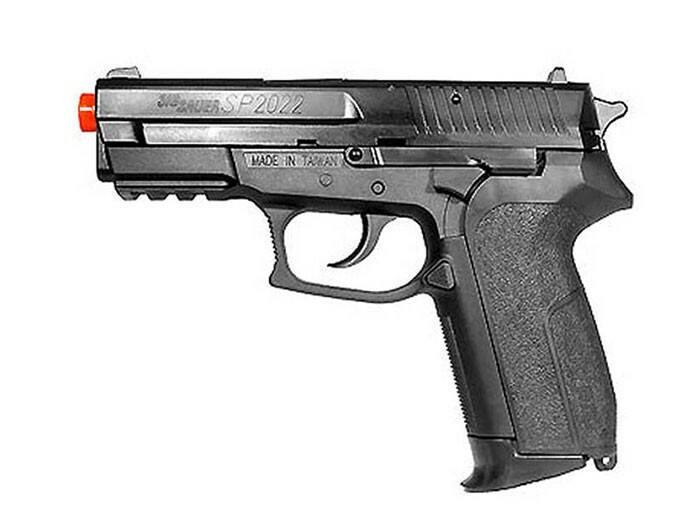 The SP2022 features a tactical rail undeneath the barrel for mounting flashlights & red dot sights, a 15 rd magazine and a shot velocity of 394 fps. This is a great sidearm choice for intermediate & experienced airsoft enthusiasts. Fires more than 250 BBs with one CO2 cartridge! Things I liked: It works great! It's super accurate and powerful. This is the first CO2 gun I've owned, and I'll definitely be getting another CO2 gun soon since I've had such a great experience with this one. I haven't had any problems with the CO2 cartridges fitting in to the gun - no leaks yet. It is very accurate, in fact, it's more accurate than I am. Truth be told, you really can't make a pistol any more accurate than this. I can hit a soup can from 10 meters away. Also, one of the best things about this gun is the price! You could easily pay twice this for an airsoft gun that not even any better. 5 stars. No question. Things I would have changed: Not much, but it is a little annoying to have the gun be made entirely out of plastic. However, you can get the metal slide version (I think it may also come with some other metal parts as well.) But that's $20 more. However, besides the feel of it, there's really nothing wrong with it being plastic. And, for being plastic, it has a pretty good feel. Other than that, there really isn't anything I would change about this gun. 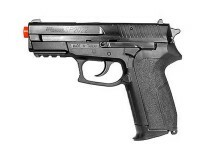 What others should know: If you're looking into getting a gas airsoft pistol, or any airsoft pistol for that matter, look no further than this one. You really can't find anything better for this price. Things I liked: Very accurate...i was amazed to hit a penny hung on scotchtape at 25 foot. This gun shoots better then i do. Its cheep and i have put 5000 bb's through it without issue so far...i think it will last pretty well. It is very powerful and will go through a thick card box at 15 ft so be be careful! I shoot indoors most of the time so be sure to hang a sheet as a backstop and wear eye protection. Now as to gas use...its pretty good but dont expect to get 250 good shoots... I getabout 150 good ones at approx 15 to 20 feet before i change powerlet. Drop off in velocity was sudden, which is good. A good thing about having the powerlet in the mag is that you can alternate and let the gas warm up without pausing too much. Things I would have changed: make it all metal with blowback and ill be sooo happy.